I just came across an issue where when I set the module field type as file I get 'Cannot read property 'replace' of undefined' in browser console. 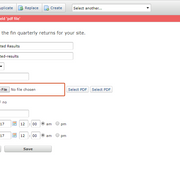 Also in the admin view while creating a record I can see select PDF button 2 times which should be upload PDF and Select PDF. Ohhk, I am getting back here because I guess the fix was not handled or something breaks while/after uploading the file. Also the select pdf button which populates the path of the selected image is not populating the path as well and hence the select pdf functionality is also not working as expected. Sorry, If you read the previous posted comment. Multiple select PDF button issue is sorted, also the passing of filename in the values also worked and I get the full filename below the upload field after the save action. But the file is not saved in the given location. File does not exist in the location, do I have to handle the upload myself? The mime type of both uploaded and not uploaded files are application/pdf. If it's for some of the PDFs and not all of them, it maybe an issue with how the server is sending the mime types or the browser. Are you certain that the mimes being returned are "application/pdf"? I would debug in the CI_Upload::_file_mime_type() method. Are you certain that the mimes being returned are "application/pdf"
CI - debug in _file_mime_type() -> application/octet-stream; charset=binary for the file which is not uploading. I get the following in logs.